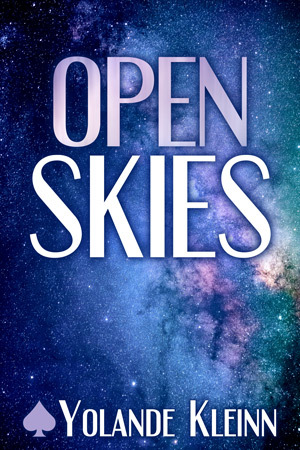 Open Skies is part of Less Than Three Press's Solitary Travelers collection: an awesome collection of stories and novels featuring asexual and aromantic protagonists in a variety of genres. "I have it on unimpeachable authority that you two can find anything." Eleazar Dantes spoke with a gruff voice, deeper than his short stature might suggest. For all that he was stocky around the middle, there was something delicate about the deeply lined contours of his face, and his suit might have cost more than a year's rent for the office they were sitting in now. Dantes had introduced himself imperiously, and Kai believed the name was genuine, not least because he had heard it before. Beyond that, despite the fact that Dantes was human, Kai was having trouble getting a read. He knew Eleazar Dantes by reputation, but he couldn't decide what to make of the man as a prospective client. Kai glanced to his left, eyes seeking his partner. Ilsa was perched on the edge of the only desk in the cramped office. Her face, sienna dark with even deeper freckles, was a practiced blank. But Kai recognized the twitch of her left pinky finger atop her knee: a subtle signal of distrust. Kai shifted his weight and returned his attention to the newcomer. The uncomfortable chair creaked beneath him in protest. Dantes sat in a similar chair, but he didn't look the least bit discomfited by the rickety metal edges or the hard back. There was patience in the carbon gray of Dantes's eyes, and his gaze slipped between Kai and Ilsa as though gauging his target. His focus finally settled on Ilsa and her easy perch. "Miss Vance." Dantes spoke with calm determination, leaning forward to emphasize the subtle plea in his voice. "Whatever concerns you might harbor, I give you my word they are baseless. I'm willing to pay up front for any expenses you might incur on my behalf, and if you're successful I will double your usual fee." Rather than reassuring, the generous offer gave Kai pause. And though Ilsa's face showed no outward sign, he knew it had tripped her instincts just as soundly as his own. Their fees were imposing to begin with. For a potential client to offer double wasn't simply unusual; it was potentially dangerous. Whatever Eleazar Dantes intended them to find, he wanted it with a desperation that straightened Kai's spine in alarm. He and Ilsa were a competent partnership—Vance & Othen, Professional Finders had built themselves an impressive reputation—but any customer intent on overpaying was best approached with caution. "We can't accept your contract if we don't know what you're looking for." Ilsa's steady tone gave no hint of unease or mistrust. She folded her hands together over her crossed legs and rested twined fingers atop navy-blue dress pants. There was nothing but reassurance in her voice when she continued, "There's no need to be cagey with us, Mr. Dantes. My partner and I understand the importance of discretion. Whether or not we agree to take your case, nothing you say will leave this room." Dantes's eyes cut away from Ilsa and skated sideways, catching Kai with piercing weight. "Is that true, Mr. Othen?" Dantes peered intently at him. "Will you guard my secrets as if they were your own?" "Would your unimpeachable authority have recommended us otherwise?" Kai raised one eyebrow but kept his expression otherwise bland. He had nothing to prove to Eleazar Dantes. He certainly wasn't going to defend his own discretion to a man who had already traveled seventy parsecs to offer them double their usual rate. He held himself perfectly still beneath Dantes's pointed inspection, waiting out the scrutiny with practiced patience. If Dantes intended to discomfit a reaction out of Kai, he was going to be profoundly disappointed. After several awkward seconds, Dantes gave ground. He nodded in quiet satisfaction. "Very well." There was dismissal in the casual shift of his glance as Dantes returned his attention to Ilsa. His brow creased deeply beneath the curl of black-and-silver bangs, and his voice fell painfully somber. "I'm looking for my daughter."